Show me passion and I’ll show you a great teacher. 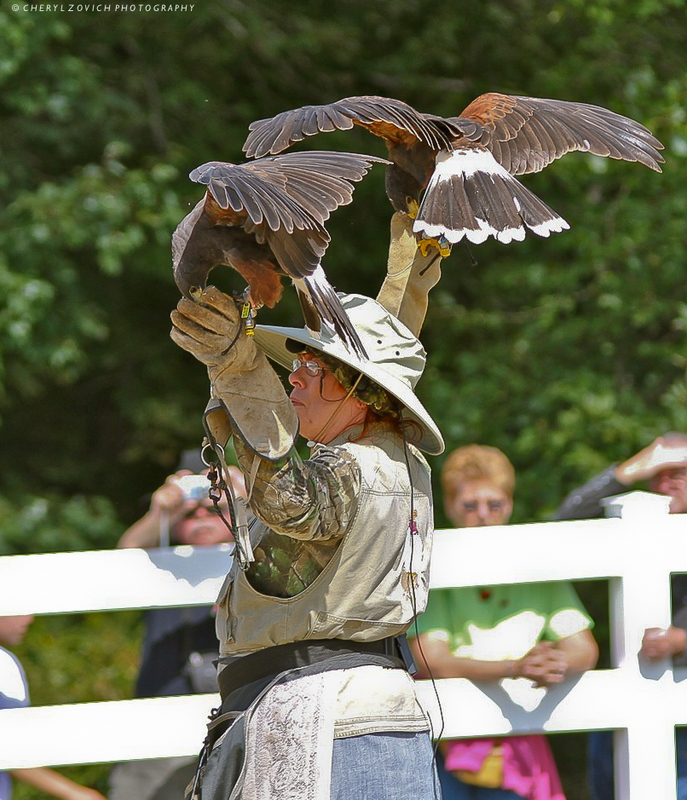 This woman and her husband did a raptor demo at a large local fair. When I first laid eyes on her my initial thought was: Whack-a-do! I mean, her choice of clothing seemed a bit odd. But as the program progressed I became engrossed in the show. (And I learned that her attire was chosen for a specific reason) This woman’s desire to educate her audience went far beyond any other wild animal demo I’d ever seen. Animals can be unpredictable and therefore, all animal performances can have moments of entertainment. But It didn’t take long to see that this woman was downright serious. She was almost bursting with passion and pride for her raptors and she was deeply committed to making sure her audience walked away with at least one new tidbit of knowledge about the birds. Did she strike me as being a wee bit odd? Yes, but it was her passion that really made her stand out as a great teacher. Nothing excites me like having the opportunity to photograph a hawk in the wild. I’m not sure if the thrill is from the challenge of the shoot (it’s hard! ), or if it’s just because I like hawks so much. In this case, the excitement hit me during the processing. Until then, I didn’t realize this hawk was missing an eye. I’m always secretly hoping this hawk shows up in my photos again someday. Every couple of years we get a pair of hawks that mate and nest somewhere close to our property. 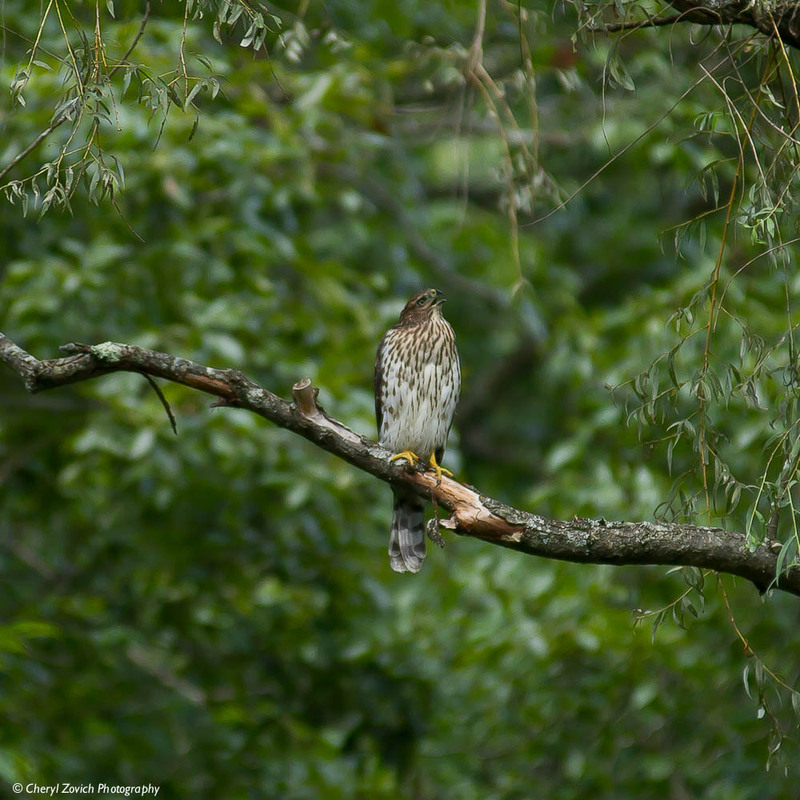 Two years ago a striking pair of hawks raised their young in the woods across the street. This year, they picked a big old white pine out behind our new barn and built their nest in the crotch of the tree. There’s always lots of activity when the young are being raised, but it’s nothing compared to the racket once the chicks have fledged. Apparently, like teenagers today, the juvenile hawks stick around for the summer and harass their parents into feeding them. They chase their folks from tree to tree, calling out pathetically for morsels of food and parental attention. The result is four loud, frantic, very large birds flitting from tree to tree all day long. At first I thought it was pretty cool. No matter what time of day I stepped out I was likely to find one or more hawks perched on a low branch nearby, screeching back and forth to each other. But that was back when we were in the throes of a heat wave, when all my windows were closed, the air conditioning was on and I was spending as little time as possible outdoors. Now the heat and humidity have moved on and I’m trying like crazy to get caught up on the gardening and lawn projects that got shelved during the heat. To say the hawks are distracting is a mild understatement. I’m torn between throwing down my gardening tools and bolting for my camera or grabbing ear plugs. I thought it would be easy to capture a few photos of the family, but so far I’ve traipsed all over tarnation and I’ve had very little success. A few days ago we had a grey, misty morning and as luck would have it, I heard one of the youngsters calling plaintively from the willow tree out back. I grabbed my camera and tripod and holding my breath, crept out the basement door. Would the hawk sit still long enough for me to fire off a couple of frames? Barely, but this is one of three photos I got. I would have liked a few seconds more to really get the camera better focused, but it wasn’t to be. 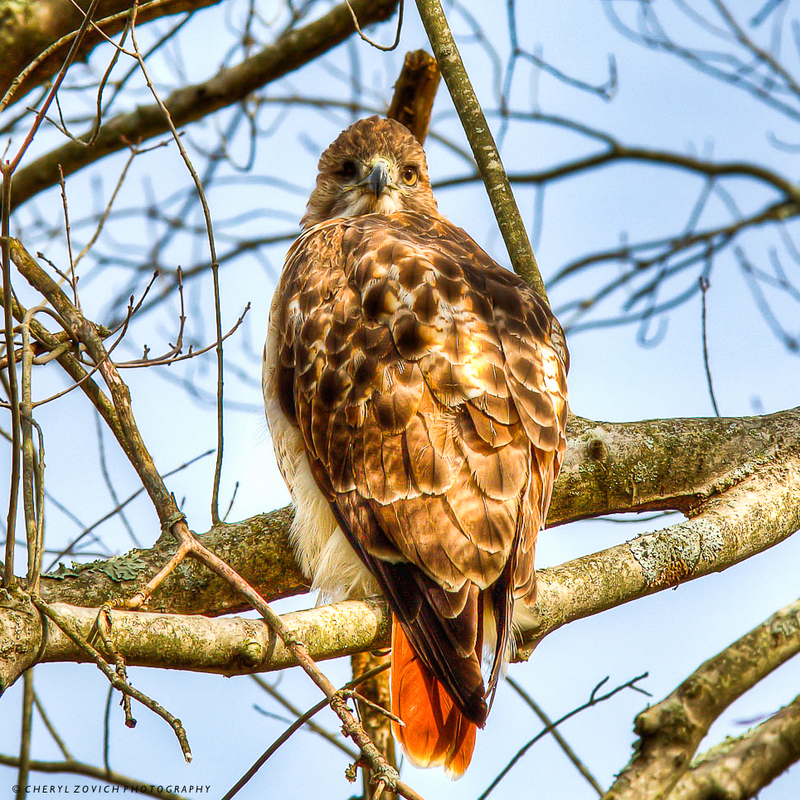 Young hawks are especially leery of people and it didn’t stick around long enough for me to make any corrections. Better luck next time I guess! Note: I don’t know why, but you have to click on a photo now to see better resolution. Anyone know what’s up with that? Annoying ….. 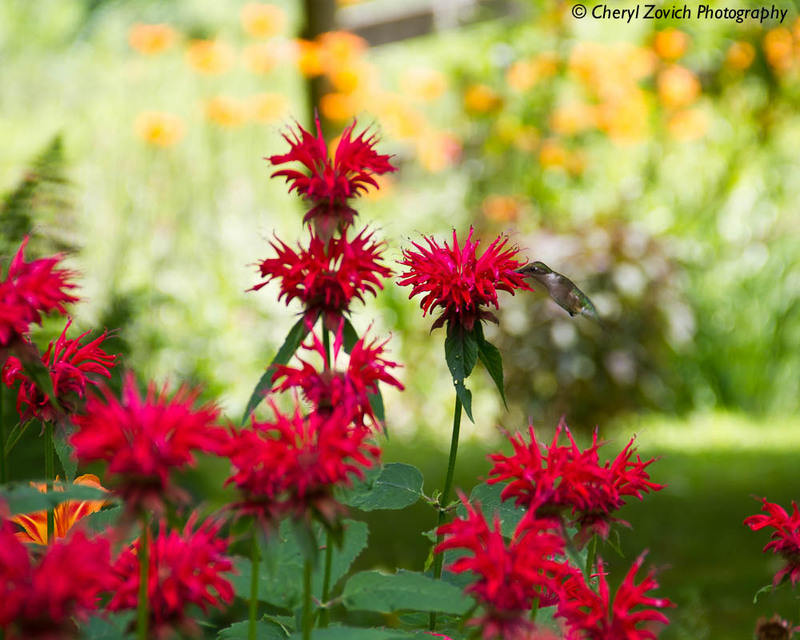 I wasn’t trying to photograph a hummingbird, but one decided to show up anyway! My shutter speed wasn’t set to catch it very clearly, but it’s better than nothing. This little pollinator was pretty fearless and several times it hovered only a few feet away and stared right at my camera. I think it was trying to figure out if I was a friend or foe! I’m finding the longer I stand in one place at the garden’s edge the more nature just accepts me and carries on. Caught, between letting go and drifting off on a breeze. I’ll risk being repetitious and post another picture of this beautiful hawk. Here, it’s watching the walkers who are about to ask me what I’m shooting. I knew someone or something was approaching before I heard them because the bird’s head swiveled abruptly in a different direction. While the hawk seemed to pay very little attention to me, it’s gaze stayed fixed on the pair until they walked out of sight. Either way, I’m very thankful that I had the opportunity to take so many good pictures of this hawk. Truly, this was a really big thrill for me! That I somehow managed to capture several semi-decent shots of this hawk was a huge thrill for me! First, the circumstances were a bit unusual and second, it’s the first time I’ve shot any wildlife since my eye troubles began last March. I was driving home from the grocery store and had just pulled onto my road when a large shadow passed over my car. 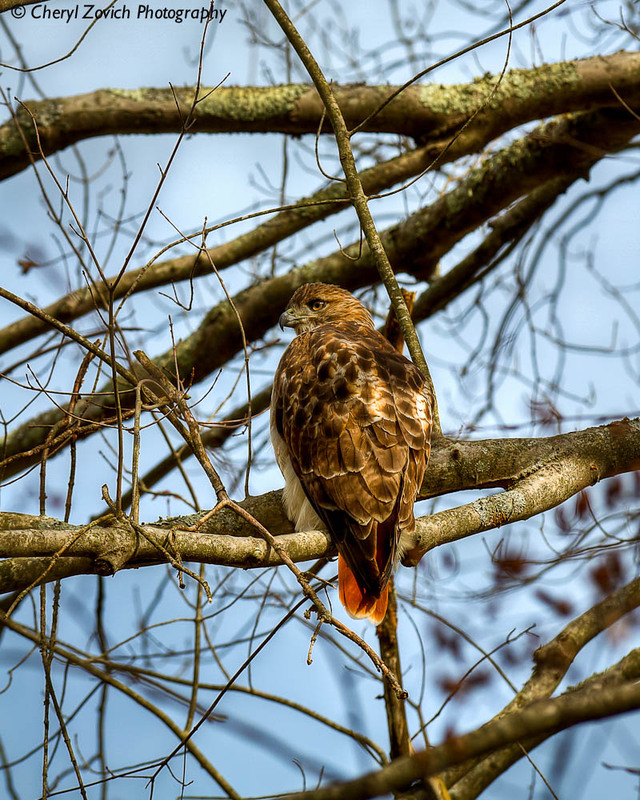 As soon as I could safely pull over I peered upward and saw a very large hawk glide across the road and into the woods, where it landed gracefully on a low branch of a tree. My car idled as I sat and watched the bird, cursing my bad luck that I didn’t have my camera with me. I immediately began to calculate how long it would take to drive to my house, run inside and grab my gear (which would require a lens change) and drive back? Would the hawk stay put or fly off after I left? I could tell the bird was starting to settle into a roost, so I decided to try to make a go for it. I didn’t hurry or panic, I simply drove home, got my gear and drove back. Much to my surprise, the hawk was still perched comfortably on the same branch! It’s always a bit of a chance when you try to shoot birds in the woods. Wind can cause tree branches to move, making the results blurry and limbs and leaves often cast shadows that obscure some (or all) of the desired target. I stood in the middle of the street with tripod in hand, trying decide how close the bird would let me approach before showing alarm or flying off. I inched forward a step at a time until my advance was blocked by a stone wall at the shoulder of the road. The bird watched me the entire time, but held it’s position. I decided not to chance scaling the stone wall since I didn’t think I could do it without rousing the bird from it’s roost. I set my tripod down, made some adjustments to my camera and started shooting. OK, does that make any sense? You see a crazy lady standing by the road side, head glued to a big honking camera on a tripod and you TALK to them? I mean, what else would I be trying to shoot if not wildlife and if so, wouldn’t it make more sense to be quiet? I guess not. I didn’t reply, but the walkers continued by, chattering loudly the entire way. Fortunately, the hawk was comfortable and it didn’t decide to take off. I stayed and shot as many frames as I could, then decided I should try to move closer. I reasoned that if the hawk flew off I wouldn’t be going home empty-handed, but if I could obtain a better (or different) vantage point then why not try? I got about halfway over the stone wall before the hawk had had enough. It launched into the air, flapped it’s massive wings a few times, then glided off to a tree beyond the reach of my lens. Giddy with excitement, I drove home. I still had several bags of groceries to unload and put away before I could download my pictures and see what I had. Needless to say, I was pretty pleased! I think it takes an enormous amount of skill and good luck to shoot wildlife with any real success. (And a big honking lens) I’ll never have that kind of skill or the equipment to be that good, but I’m tickled pink when the sun, moon and stars all align, and I get lucky!